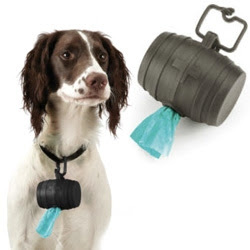 No, I don't have a dog, but if I did I would buy this cute-and-functional doggie barrel bag holder. I am a firm believer in scooping one's poop (or, more accurately, one's pet's poop), probably because I'm not the sort of jackass who thinks it's okay to leave dog crap on the sidewalk. However, that's another rant for another day.